Founded in 2000, Quanta's Enterprise Solutions Business Unit (ESBU) was an innovator which focused on ODM/OEM business development and manufacturing of high-performance IT equipment, enabling enterprises to manage IT more effectively, to enhance business more efficiently and as a result, to get more profits eventually. Product lines include high level blade servers, 1U/2U/4U rack servers, server motherboards, 10GbE LAN cards, storage, and L2/L3 networking switches…etc. In recent years, cloud computing has become the market trend in the world. Therefore, ESBU was renamed to be Cloud Computing Business Unit (CCBU) in 2010. CCBU has more than 600 experienced engineers dedicated for product development. By leveraging Quanta's strong manufacturing infrastructure, worldwide logistics, service centers, and supply chain, CCBU has successfully customized datacenter hardware solutions for international firms, telecom companies, and cloud service providers worldwide and is getting good prestige in the cloud industry. In addition, CCBU is also devoted to provide green solutions from product design, customization, manufacturing, to stack & rack integration for your existing datacenter architecture and applications. Our vision is to build a partnership with our clients while developing high-performance, environmental-friendly system for corporate responsibility to our earth. 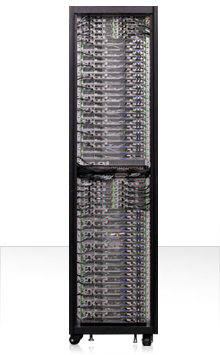 The Quanta 4U quad-processor rackmount server is designed to deliver high performance, reliability and scalability to enterprises with support for up to four multi-core Intel® Xeon® Processor 7500 series and large memory capacity in 64 DIMM slots. The expansion capacity makes it competitive and ideal for large-data-set workloads, business-critical applications (ERP, CRM, SAP…etc. ), server virtualization & consolidation, and virtual desktop hosting. With the future-ready 4U server, there is no need to reconstruct data centers when enterprises want to increase workload capacity. Quanta 1U/2U servers provide business comprehensive system solutions by supporting the latest Intel® Xeon® multi-core processor 5500/5600 sequence and IPMI 2.0. In order to satisfy business' needs on remote management to the system, the server has "KVM over IP" function. 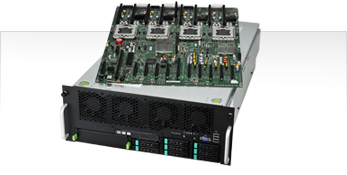 These 1U/2U new value-added servers are designed for increasing business' demands on HPC application, web-hosting infrastructure, front-end enterprise databases, minimal-downtime cluster server, and etc. Designed for the needs of enterprises and data centers, Quanta provides high quality and cost effective wire-speed layer2/3 switch products. In order to perfectly meet your evolving business requirements and new application deployments, Quanta delivers a wide range of products from 10 Gigabit to Fast Ethernet and provides options of open-source customization. Flexible, affordable and highly available, Quanta storage enclosures integrate with Quanta servers to provide enterprises simple and affordable IT infrastructure. The 4U disk enclosure is designed to meet the needs of data growth and flexibility. Users could easily scale up the storage capability with the growth of their business, and access to critical data with high reliability because of the design of fully redundant controller modules, power supplies, hard disks, and cooling modules. Featuring centralized power and cooling system, the integrated rack solution is an optimized green modular design for different datacenter infrastructure, computing/storage density requirement, power efficiency, best PUE, and CAPEX/OPEX reduction.